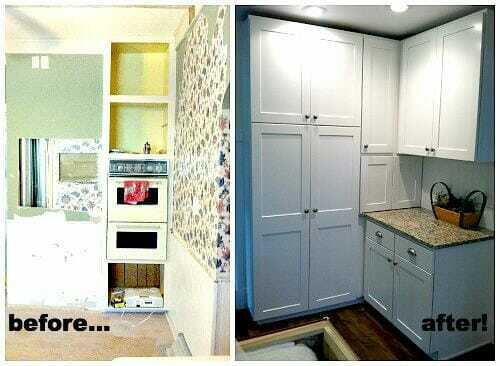 I can’t believe that it’s almost been 2 years since we completely gutted and renovated our 124 year old kitchen! When we purchased our home 3.5 years ago, we figured the kitchen would be one of the last projects we tackled — partially because we knew it would be an expensive project, but also because we really wanted to live in our house for several years before we made any final decisions on the kitchen. We figured that our kitchen needs might change based on how many children we have, how close together or far apart our children are, and how much entertaining we do, so we thought we’d wait until we finished having kids and THEN tackle the kitchen. The main reason we decided to renovate the kitchen after less than 2 years in our home was because almost all of the appliances were on the fritz. We had already replaced the refrigerator with a cheapy Craigslist find, our dishwasher was leaking at times, one of the burners on our cooktop didn’t work, and the oven had some MAJOR hot spots and didn’t have a consistent temperature. 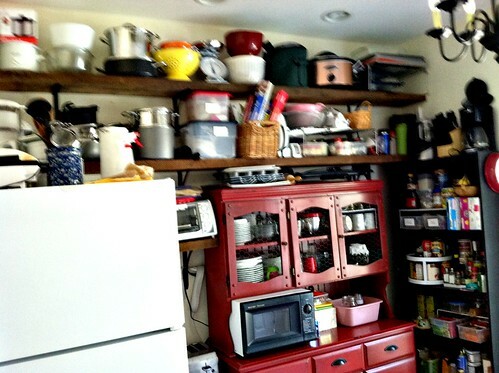 On top of that, there was almost no counter space, almost no working drawers, the layout of the kitchen was all wrong, and the floors were very uneven with obvious high and low spots, and the list goes on. So instead of spending money on new appliances for our existing non-functional and impractical kitchen, we decided to do the renovation much sooner than we originally planned. Two years later, I can not tell you how happy I am we did the renovation earlier versus waiting several more years! 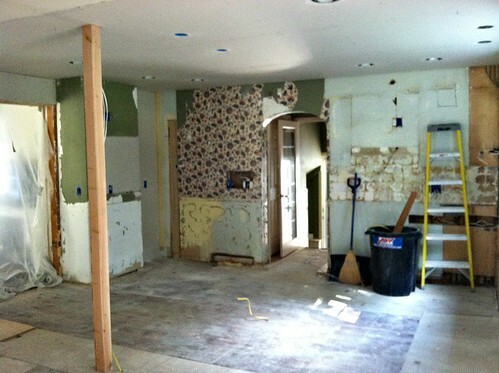 I think you’ll see why after looking at the before, progress, and after photos below! Standing by the entrance to the mudroom looking through the kitchen into the dining area. Looking from the dining room into the kitchen and back into the mudroom entrance. Standing in the living room looking into the kitchen area. Standing by the kitchen table looking into the living room. 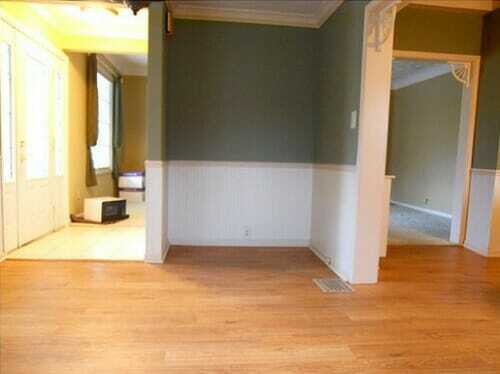 See more before/after pictures here. Yes, I could have made due with the old kitchen. 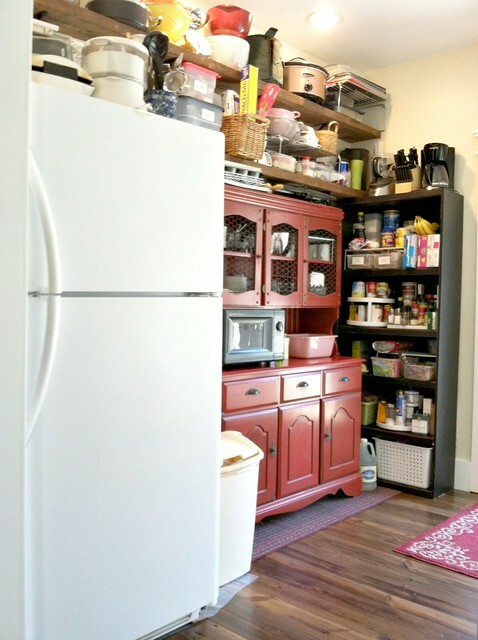 I was more than willing to live with the tiny cabinets, sticky drawers, finicky appliances, and uneven floor for a few more years. However, I honestly can’t imagine doing a massive kitchen renovation with multiple children who are hungry all the time — or worse, now that we’re washing bottles every day for Simon! Our kitchen renovation was crazy enough just trying to feed Dave and myself in the apartment-size kitchen we set up in our office. We didn’t have any counter space, no oven, no stove, no sink, no dishwasher, etc… we made it work just fine, but I’m certain it would not have been as easy with more children. We made it through 4 months without a kitchen and of course, the finished product was TOTALLY worth the hassle and inconvenience! Now, nearly 2 years later, I feel like I can finally do a follow-up post addressing some of these questions. How do you like your ___________? I’ve thought long and hard about these questions and I truly can’t come up with anything that I don’t like. 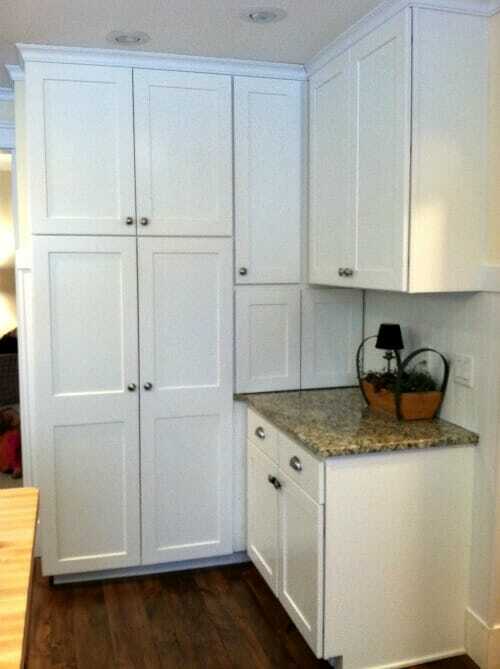 We love our white cabinets (no, they don’t get dirtier than any other cabinets). 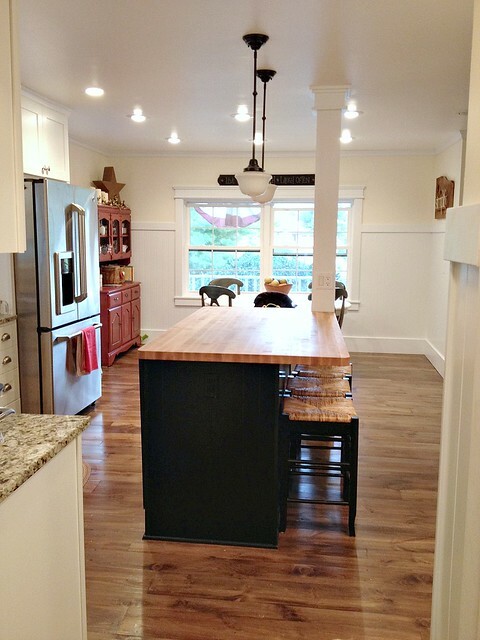 We love our appliances, the layout of the kitchen, the reclaimed barn wood floors, the trim, the windows… everything! We really tried to pick timeless materials, so I’m hoping that I’ll still love everything in 10-15 years too. Where did you buy ________? If you’re wondering where we purchased anything in our kitchen, read the very end of this post — it’s all listed out with links! Also, here’s the link that talks more about all our appliances. What do you love most about your kitchen? Boy, where do I start? I guess I’d have to say my farmhouse sink (because I’ve ALWAYS wanted one) and my dish drawer. 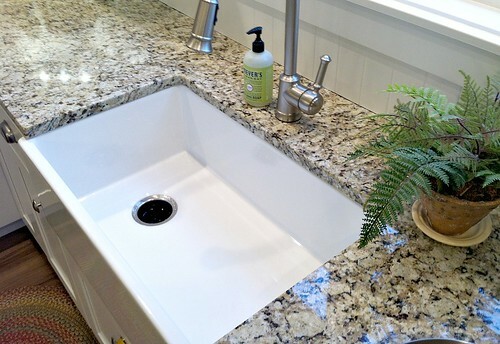 The farmhouse sink is HUGE — big enough to give Nora a bath if we wanted to! I love that it looks great AND functions well — I can wash so many dishes at one time, I’m not sure I could ever go back to a smaller 2-bowl sink. 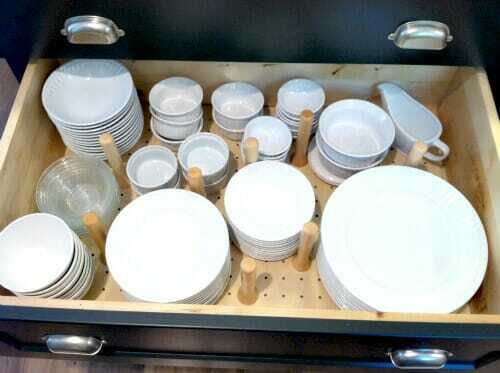 I can’t even begin to explain the awesomeness of having our dishes in a drawer. I never need to lift heavy stacks of dishes into the upper cabinets, I can quickly unload the dishwasher directly into the drawer (they are right next to each other) and Nora can already set her own place at the table. I also really love all the details we chose to make our kitchen feel more custom. 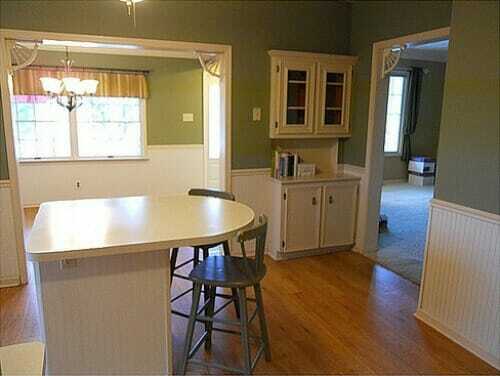 We had the cabinets go all the way to the ceiling and put crown molding around the entire kitchen and dining room. We also paid a little bit extra for matching panels to go on either side of the refrigerator — making it look “built-in” and more custom. We put TONS of electrical plugs everywhere since our old kitchen only had TWO. We also put plugs inside some of the cabinets (as well as a cable outlet) so we can have a TV and microwave in our pantry cabinet as well as a toaster and coffee maker in our “appliance garage”. If we were building a house from scratch, there are definitely things I would have done differently (like a double oven, possibly 2 sinks, and a larger island). However, working with the space and the home we already had, there’s probably not a lot we would have (or could have) done differently. 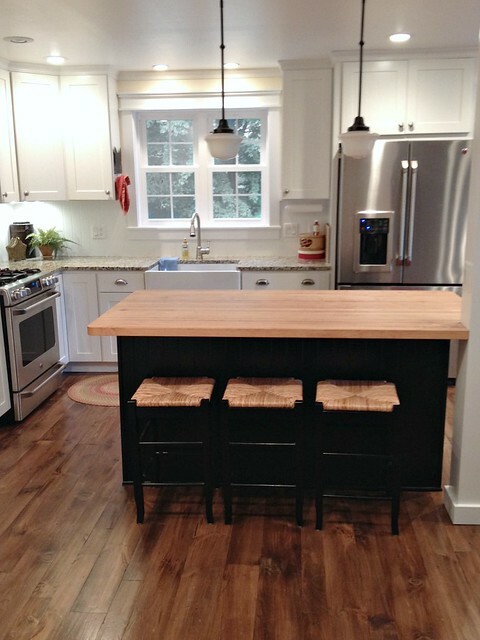 We put a TON of thought into our kitchen renovation. We questioned every decision and tried to think of any other better way to do things. Sometimes we came up with a slightly better way but realized the additional costs would not be worth it. For example, we currently have a post right in the middle of our kitchen. It’s connected to the island and many people think it’s just a decorative touch. Little to they know that it’s holding up our second floor! At the time, I really wanted to remove that post, but it would have cost us thousands of dollars more as we would have needed to re-dig the foundation of our home in order to make it structurally sound. We decided that the post would be just fine — and honestly, I really kind of like it. 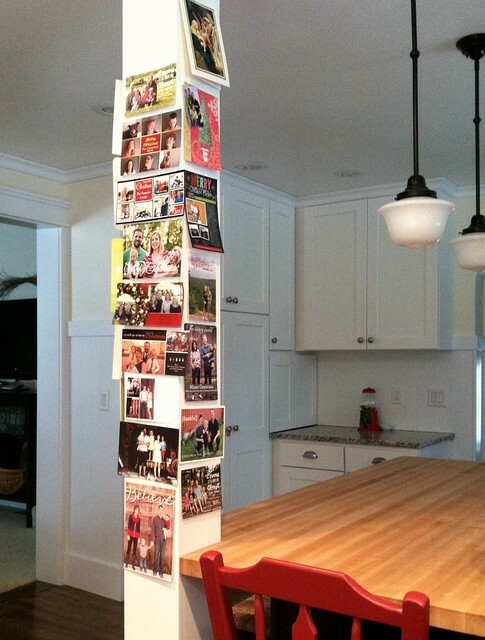 After all, it’s the perfect place to hang Christmas cards! The only thing I wish we could have done better was leveling out our floors. They were VERY uneven and had huge high and low spots. We spent a lot of time and effort leveling them off — but in the end, we couldn’t fix all the issues. We didn’t think it would be a big deal, but since we put real wood floors on top of slightly uneven sub-flooring, our floors creak like crazy! It’s definitely not the end of the world because our kitchen is on the opposite side of the house as all the bedrooms — but it is just kind of annoying. If any of you have tips or ideas to quiet a very creaky wood floor, PLEASE leave them in the comments! 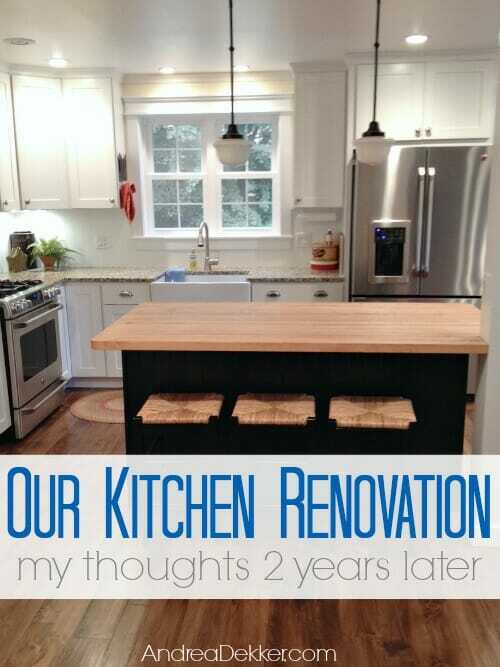 Do you wish you would have waited longer to do the renovation? As I mentioned earlier, I was initially hesitant to do the renovation after living in our home for less than 2 years — however, looking back, I’m SO glad we did the renovation early on. Not only will we be able to enjoy our kitchen for many MANY years, we also won’t have the added hassle of living without a kitchen with multiple children. Dave and I frequently reminisce about our living conditions during the kitchen renovation and we always say, “I’m so glad we’ll never need to do that again!” It was definitely a long, stressful summer — but now we’ve had 2+ extra years to enjoy our finished kitchen many times each and every day! Will you be making updates or upgrades any time soon? We don’t currently have anything planned. We would eventually like to put an instant-hot faucet on our kitchen sink — but it will be between $350 and $500 to do so and that’s not worth it for us yet. However it’s on our list of projects to do “someday”! I could also see repainting the walls at some point. I love the color right now — but I’m big on changing paint colors so I’m sure I’ll repaint eventually. Another little project we’d like to do is have a longer rectangle table with built-in seating along the window wall. However, we want to wait until we know how many children we’ll have before we build the table. Ok, so those are the questions I’ve been asked several times over the past couple of years — but if you have more questions, feel free to leave them in the comments and I’ll try to answer them as best I can! 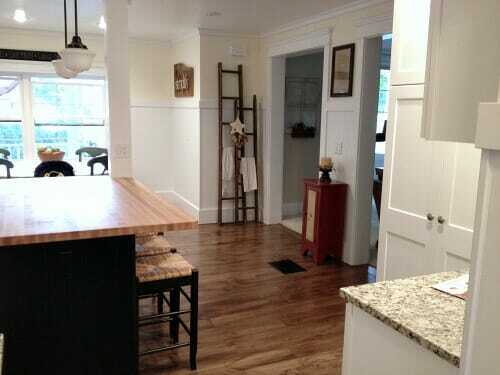 The bottom line is we’re thrilled with our kitchen renovation and SO glad we didn’t wait several more years to enjoy it! 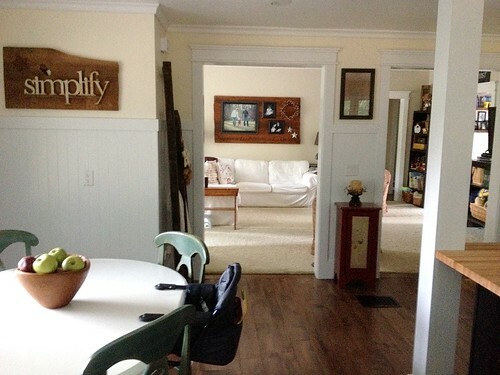 Filed under: Home • Our Farmhouse • Misc. Andrea, what is the window treatment on top of your kitchen window? Hi Beth, I’m not sure what you’re referring to because we do not have any window treatments in our kitchen 🙂 Sorry! Andrea, When the kids get older, the squeaky floors might be helpful. You’ll know if someone is in the kitchen sneaking food or trying to sneak out. Not that anyone’s kids would do that! Wow — so glad you found my blog AND that you also live in an old farmhouse! enjoy your “new” old house!! Hi! 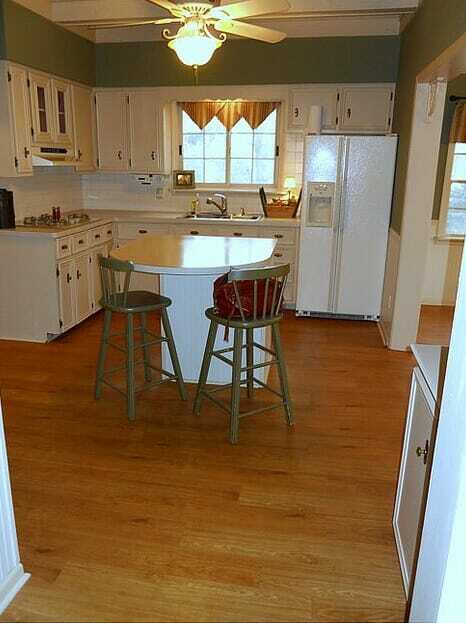 I have always loved your new kitchen. Today is the first I have noticed an under-cabinet light in the corner by your stove. Would you mind providing a few details about that light? What kind is it (i.e. florescent, LED)? Is it battery powered or wired to a switch? If wired, is the wiring in the wall or through the cabinets themselves? I have always wanted under-cabinet lighting. My husband and I are still trying to figure out the best way to go about installing them. Thanks so much, and I love your blog! Thanks Rachel! yes, we do have under-cabinet lighting and I LOVE it! Ours is wired in since the kitchen was entirely gutted anyway. The wire goes up through the bottom of the cabinet, along the side of the cabinet, and then in to the wall behind the cabinet. However, there are SO many different kids of under-cabinet lighting that you should easily be able to find something you like that’s battery powered or the kind that plug into an outlet and you can flip with a switch on the actual light. 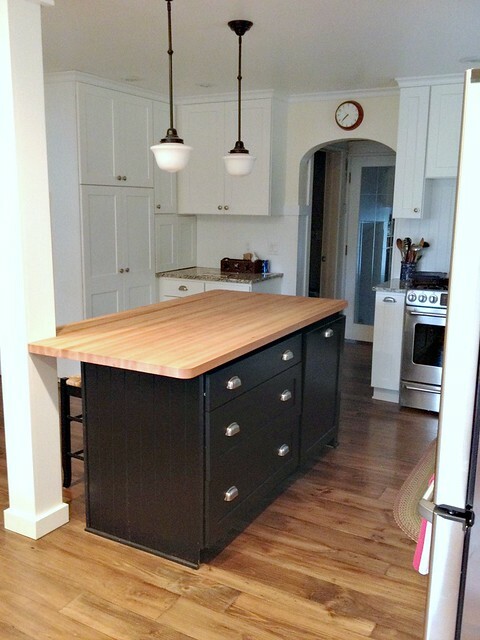 We just finished a major kitchen reno that lasted about 4 months also. So glad we did it now and hopefully I have many more years to enjoy it. Your kitchen was one of my bookmarks and served as inspiration. 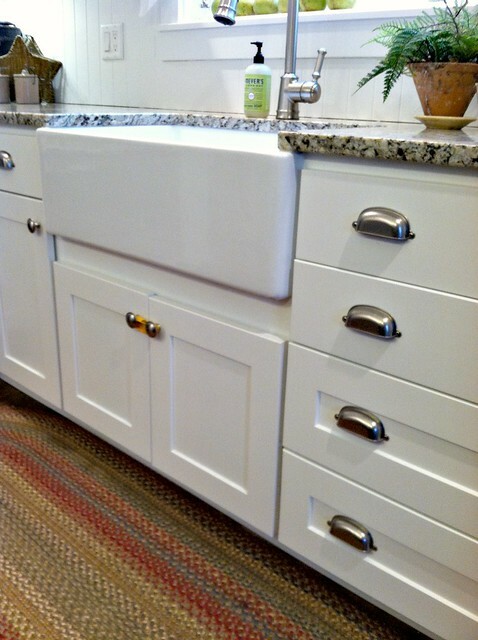 I have a farmhouse sink that is the same or very similar to yours. Mine is 33″ and my husband was actually able to fit in it before it was installed. It made for a funny picture. My husband is only 5’9″ so Dave probably wouldn’t have been able to fit in yours 🙂 My other favorite part is the pocket door we installed from the kitchen into the laundry room. So nice. My house is only 24 years old but now I have a kitchen that is my dream kitchen not a builder’s kitchen. 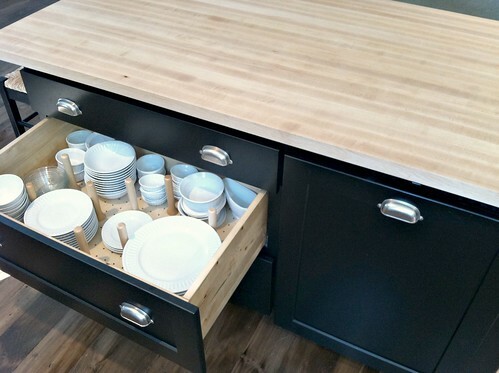 How did you keep Nora from getting into your cupboards/drawers (especially the dish drawer with all of those breakable?) Did you guys install some baby locking mechanisms? Wow. I would be happy with that renovation too! Amazing! 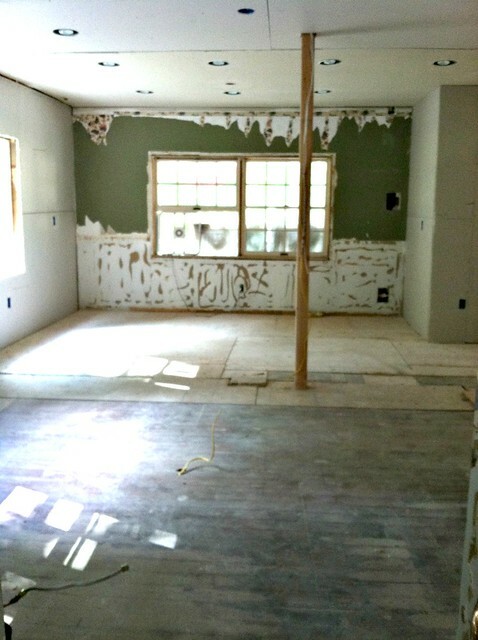 We didn’t level our floors in our master bedroom as well as we should have… Same problem. Thanks Rochelle, I’ll need to look into this! I’ll second the baby powder! It has worked well on our old wood floors.